Today we made a new discovery. A very delicious discovery. We bought beef chuck short ribs which we do not see often at the grocery store. This dish was made without following a recipe, the only important thing was to braise the ribs with liquid for a long time. The ribs were browned in a bit of oil at the bottom of a dutch oven. This adds a lot of flavor. While the meat was browning, we made the braising liquid. To make the liquid we used soy sauce, orange juice, ginger, garlic and brown sugar. After the ribs were done browning, the liquid was poured over the meat. The lid went back on the dutch oven and then we put it in the oven for two and a half hours at 350F. The meat ended up being super tender and the sauce became a sort of glaze. The were more than amazing. 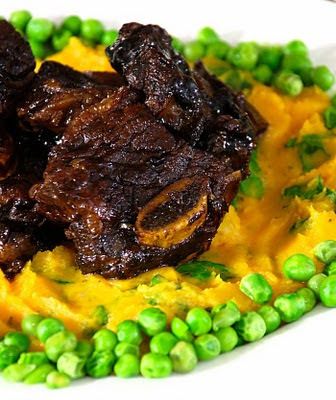 We served them on a purée of sweet potatoes and carrots mixed with spinach and peas.